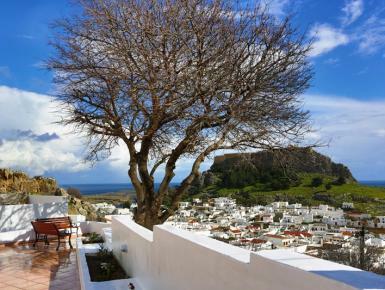 The property is located panoramic in the center of Lindos, but still away from the noisy streets. The main square is 600m away, Lindos beach and St Paul’s bay can be reached within 10 minutes on foot. Within walking distance you may find a great choice of restaurants, cafes, bars, souvenir shops etc. Public parking available (fee required) 300m away. We offer daily maid service and free Wi-Fi internet access. We can arrange taxi transfer with extra charge. All studios offer the following amenities, Satellite TV, Free Air condition, Free Wi-Fi, En suite bathroom with shower, Bathroom amenities (cream soap, shower gel, shampoo), Kitchenette (toaster, kettle, cooking hobs etc. ), Fridge, Hairdryer, Free Safe box, Iron On Request, Baby cot On Request, Change of bed linens and towels every 3 stayed overnights and Terrace with panoramic view of Lindos with tables and chairs.